In March our colleagues in Technical Services and Cataloging added 413 items to the Center for Restoration Studies, Rare Books, and Taylor Hymnals collections. Some are new to us; in other cases these new additions gave us a second copy. Several items are boxes of unbound periodical issues that were previously uncataloged. Some are tracts and others are A/V in various formats (mostly cassette tape and CD’s and a few VHS). Further, the work performed on some items reflects original cataloging, which is a tremendous contribution to knowledge about information resources from and about the Stone-Campbell Movement. 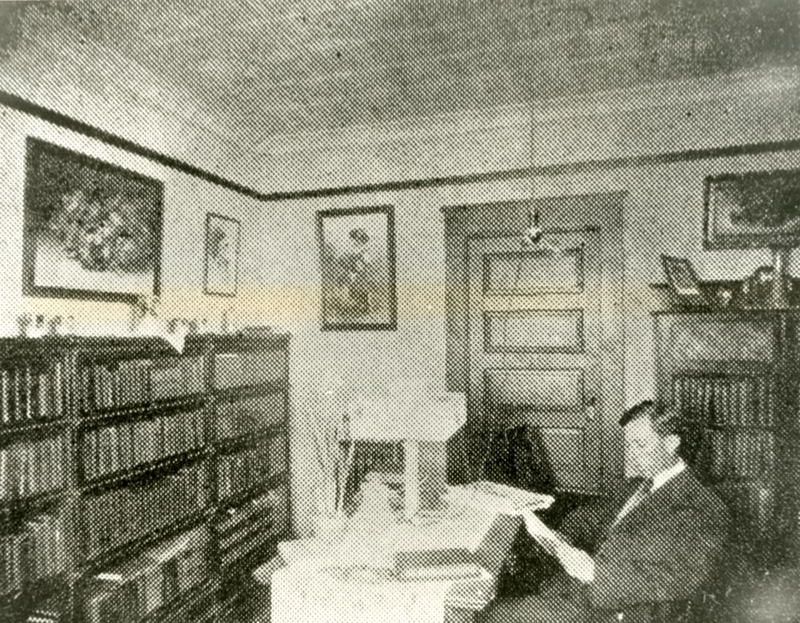 The Library in Daisy Hall, with a Jesse Sewell reading a book at a table and shelves of books around him. Our goal is to build a comprehensive research-level collection of print materials by, for, and about the Stone-Campbell Restoration Movement. But beyond assembly and preservation, a collection should be discoverable by those who need the information. Collecting and preserving is only part of our task; those objects must be described and made available. Thanks to the close and careful work of our colleagues upstairs, who describe our holdings, these materials are now discoverable. By discoverable I mean a patron can utilize our online catalog (such as by searching by author, or title, or subject) to find these materials. In February our colleagues in Technical Services and Cataloging added 500 items to the Center for Restoration Studies, Rare Books, and Taylor Hymnals collections. Some are new to us; in other cases these new additions gave us a second copy. Several items are boxes of unbound periodical issues that were previously uncataloged. Some are tracts and others are A/V in various formats (mostly cassette tape and a few VHS). Further, the work performed on some reflects original cataloging, which is a tremendous contribution to knowledge about information resources from and about the Stone-Campbell Movement. Our goal is a comprehensive research-level collection of print materials by, for, and about the Stone-Campbell Restoration Movement. But beyond assembly and preservation, a collection should be discoverable by those who need the information. Collecting and preserving is only part of our task; those objects must be described and made available. Thanks to the close and careful work of our colleagues upstairs, who describe our holdings, these materials are now discoverable. By discoverable I mean a patron can utilize our online catalog (such as by searching by author, or title, or subject) to find these materials. Cotham, Perry B. (Perry Boyd), Cotham-Davis debate, on the Godhead and miracles today : held in the high school auditorium of Swainsboro, Georgia, December 7-10, 1986. Bales, James D., Shall we splinter?? Ainslie, Peter, The message of the Disciples for the union of the church, including their origin and history. Memphis School of Preaching lectures : a survey of the first fifteen years. Shackelford, Don. A survey of church history. Hyatt, J. Philip (James Philip), The heritage of biblical faith, an aid to reading the Bible. Thompson, Rhodes. Voices from Cane Ridge. Finegan, Jack, Clear of the brooding cloud. Stevenson, Dwight Eshelman, In the Biblical preacher’s workshop [by] Dwight E. Stevenson. Bogle, Fred R., Who is saved? Jones, Claude C., The teaching methods of the Master. Jones, Edgar De Witt, The royalty of the pulpit; a survey and appreciation of the Lyman Beecher lectures on preaching founded at Yale Divinity School 1871 and given annually (with four exceptions) since 1872. Davison, Frank E. (Frank Elon), Thru the rear-view mirror. Kemp, Charles F., Preparing for the ministry. Waldrop, W Earl. What makes America great? Robinson, William, What Churches of Christ stand for. the origin, growth, and message of a nineteenth century religious movement. Ferré, Nels Fredrick Solomon, Making religion real. Montgomery, J. Dexter. Disciples of Christ in Argentina, 1906-1956; a history of the first fifty years of mission work. Heron, Frances Dunlap. Here comes Elijah. Finegan, Jack, Light from the ancient past. Jones, G. Curtis (George Curtis), Christian stewardship : what are you worth? Harding University. Harding University lectures. Straton, Hillyer H. (Hillyer Hawthorne), Solving life’s problems, methods of the Master. Clawson, Bertha Fidelia, Bertha Fidelia, her story as told to Jessie M. Trout. Swearingen, T. T. (Tilford Tippett) Must a man live? Hopper, Myron Taggart, The candle of the Lord. Grafton, Warren. A Saturday night talk with God, and other editorials. Fiers, Alan Dale. This is missions; our Christian witness in a unchristian world. Jones, G. Curtis (George Curtis), March of the year; especial sermons for special days. Jones, G. Curtis (George Curtis), Which way is progress? Hearn, Roy J. Sermon outlines of Roy J. Hearn. Bible foundations : maturing discipleship series. Lecture outlines of the annual Bible lectureship. Finegan, Jack, Wanderer upon earth. Harding College. Harding College lectures. Hartzel, Jonas. A defense of the Bible against the charges of modern infidelity; consisting of the speeches of Elder Jonas Hartzel, made during a debate conducted by him and Mr. Joseph Barker, in July 1853. Reeve, Jack V., A God to glorify, through Christian stewardship. So great a cloud : Women of the Christian Church in Georgia, 1882-1986. Why do the heathen rage? : Second Psalm and Acts 4:25. Keith, Noel L. (Noel Leonard), The human rift : bridges to peace and understanding. Ware, Charles Crossfield, The church bell : a history of the First Christian Church, Wilson, N.C.
Miller, Raphael Harwood, Who lives in you? McPherson, Chalmers. Disciples of Christ in Texas. Nelson, Robert Gilbert. Congo crisis and Christian mission. Howard, V. E. (Verna Elisha), Does it make any difference? Howard, V. E. (Verna Elisha), The Lord’s Day or the Sabbath? Howard, V. E. (Verna Elisha), Is the Church of Christ a denomination? Humphrey, Don, What makes dancing wrong? Hinds, John T. , Which church did Christ establish? Hinds, John T. , Is feeling an evidence of pardon? Hinds, John T. , Which church did Christ build? Lanier, Roy H. Why be a church member? Knight, M. F., What must I do to save a soul? Buchanan, Logan, Whose prayer will God hear…? The Raymond Kelcy tape collection catalog : Oklahoma Christian College Library presents. Kelcy, Raymond C., What must I do to be saved? Disciples on the rim of Asia : a study book. Ware, Charles Crossfield, Hookerton history. Wilson, Bert, Know your local church. Good way hymns and songs : for the blood-washed : for revival work in convention, camp, tabernacle, protracted meetings and sabbath schools. In January our colleagues in Technical Services and Cataloging added 132 items to the Center for Restoration Studies and Taylor Hymnals collections. Some of these were new to us; in other cases these new additions gave us a second copy. Further, the work performed on some of these items reflects original cataloging, which is a tremendous contribution to knowledge about information resources from and about the Stone-Campbell Movement. Paulsell, William O. (William Oliver), Spiritual inheritance : claim it! live it! United Christian Missionary Society. Handbook of the United Christian Missionary Society : a board of missions and education of the Christian Churches (Disciples of Christ).